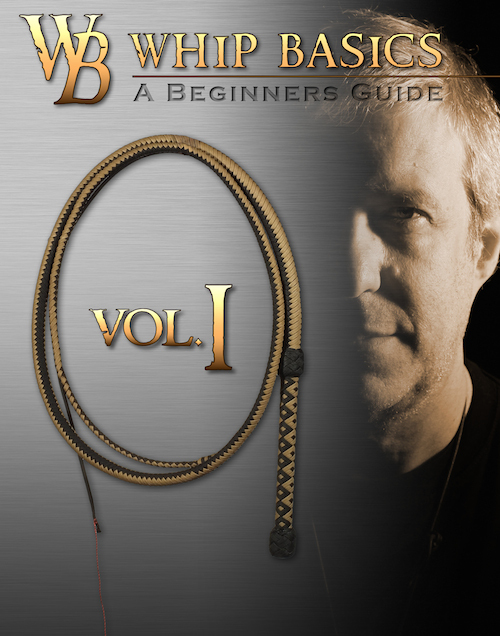 The tutorial „Whip Basics – A Beginners Guide” is available in PAL and NTSC. to the fundamentals of whip cracking on the market. I would recommend this series to any beginner in the whip cracking sport. Well....what can I say. This is the BEST Whipcracking DVD series you will find anywhere. I would have to say that Robby doesn't miss anything AT ALL. 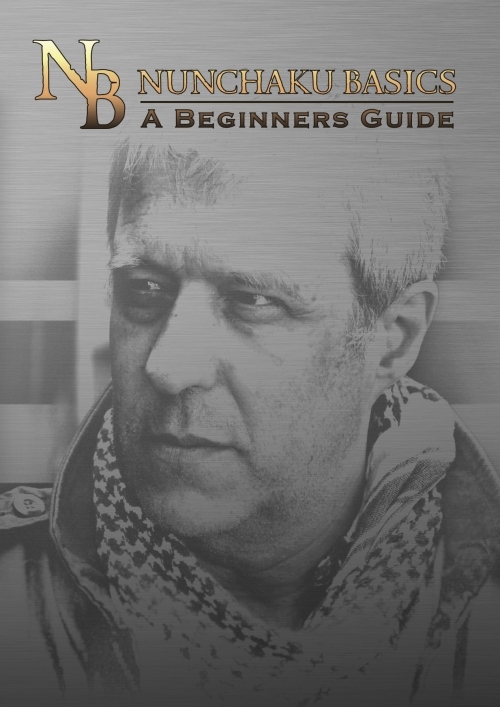 He understands very well from a beginners perspective and is able to convey his message in a clear and easy to understand way. It is a very professional production that is a must for any beginner or professional whip hand. The team, the producer, and teacher who brought you the Whip Basics series, now offers a whole new tutorial: “Nunchaku Basics – A Beginners Guide”. Chapter by chapter and step by step, this video is a teaching guide that will help the student to master the Nunchaku. It makes no rash promises. You will not become a “Nunchaku hero” in three days; however, you will see that the Nunchaku is far more than a flashy “weapon of choice”, as portrayed in action movies, or a hit-and-run instrument of violence and destruction. Instead, the viewer will learn that this is a true sporting tool and its use is truly an art in and of itself. Here, with step-by-step and easy-to-follow instructions, you can learn to use the Nunchaku properly and safely. You will find this skill will improve your hand-eye coordination, will give you a better sense of timing, will sharpen your reflexes, and help you sharpen whole-body coordination. As with any athletic tool, learning to use the Nunchaku requires patience, consistency, and above all, diligent practice. No one can master a skill like this in a week, or even a month, but if you follow these instructions carefully and don&apos;t try to speed things up, you can succeed. If you&apos;re willing to invest the time and the patience, this guide will teach you to use the Nunchaku safely and effectively. 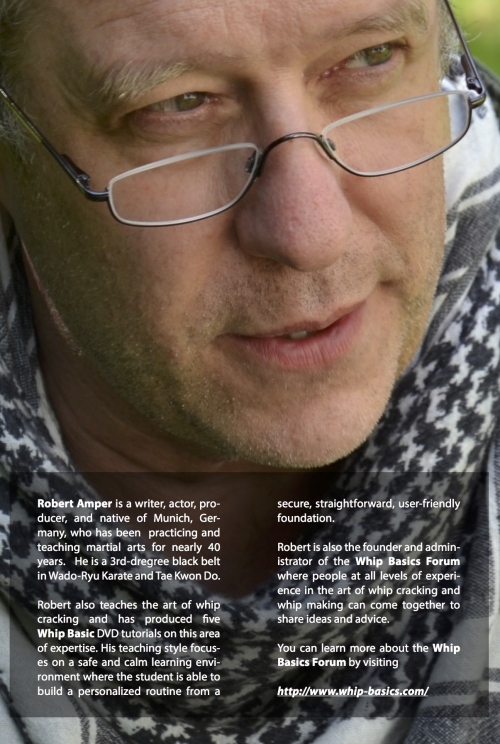 Robert Amper works as whip coach for tv shows and cinema, gives lessons and seminars for many years. He's a 3rd degree black belt and gives basic and advanced training sessions for Karate and Taek won Do teachers, too. This tutorial demonstrates and explains the five best known basic techniques: Circus Crack, the Underhand, Forward, Horizontal & opposite Horizontal Crack. It goes into detail on the various techniques and points out the most common beginner mistakes. In the end, you will learn a combination of four cracks. This instruction video focuses on people who are interested in the art of whip cracking, but have never wielded a whip before. It’s a lesson for true beginners. For advanced practitioners, this tutorial offers the chance to review one’s own basic techniques in detail. Aspect ratio: 16:9 – Runtime: ~51 min. man’s Crack, a new 10-Crack-Routine and focuses on target work. points out the trip hazards for beginners. you the tools to teach others. Aspect ratio: 16:9 – Runtime: ~47 min. 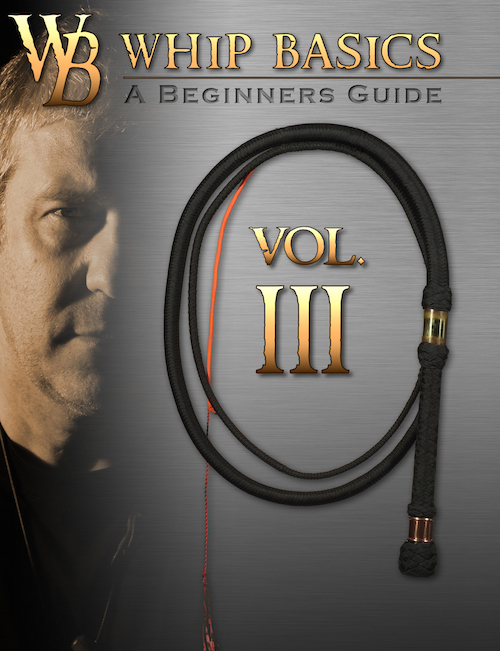 As the third part of the “Whip Basics” series, Volume III directly builds on Volume II, and among other things explains the Figure Eight Overhead, how to safely turn during complex routines, and also goes into detail on wrapping objects and persons safely. As conclusion, the combinations from Volume I and Volume II will be merged and extended into a Combination of 23 cracks. 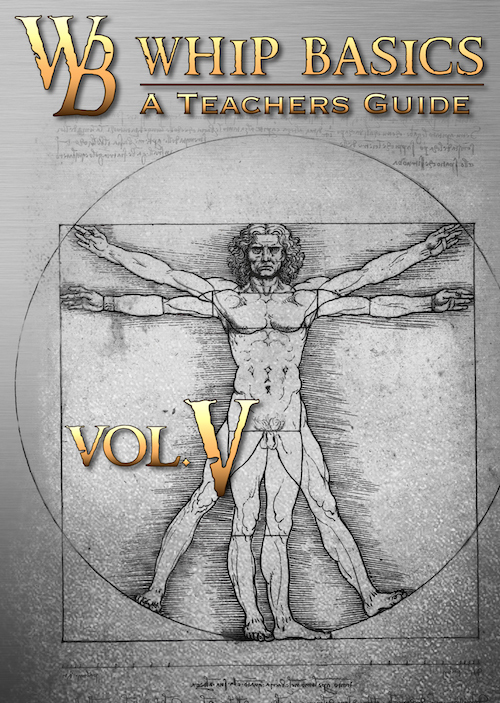 This tutorial, however, is only recommended for advanced students, or those who have worked through Volumes I & II entirely and successfully. In this tutorial, Robert Amper once more offers hints and ideas to whip coaches and advanced students in order to teach with success. Robert Amper tells you how to ask the right questions, various things to watch out for and most of all make an informed decision when buying a whip. 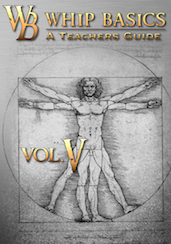 One of the most successful whip tutorial series is continued in Volume IV. 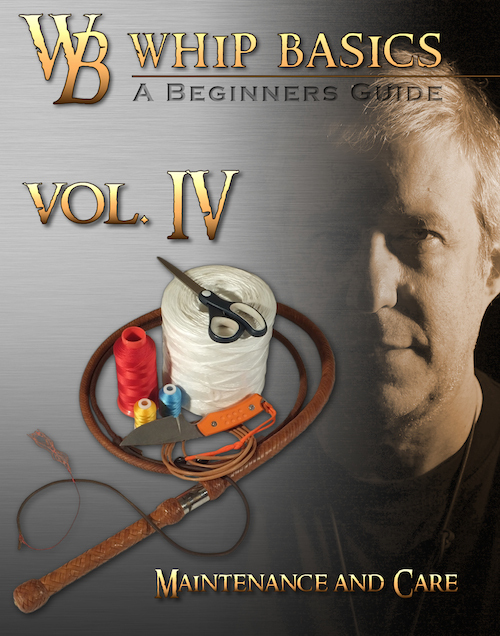 While the frst three DVDs covered techniques around the various cracks and routines, Volume IV looks at maintenance and handling of whips. 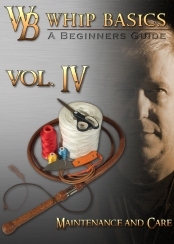 Volume IV tells you how to get leather whips through the winter, how to make nylon or polyester crackers and various methods to attach them and also explains in detail how to change a fall without cutting your whip! It will, moreover, give you hints to improve your own training and an overview and illustration of various whip types. On top of that it will give you tips and tricks for performances in stage shows, TV appearances or presentations at a family BBQ. There’s no reason not to perform professionally! Aspect ratio: 16:9 – Runtime: ~106 min. If you're interested in learning how to crack a whip, you can order four single DVDs. Or you can safe and get the complete edition in one package. When you buy all four DVDs in single boxes you pay (worldwide) 156.00 Euro. When you decide to take the four disc compilation, it's only 109.00 Euro. That way you safe 47.00 Euro! The only difference is, that you have one cover on your shelf, instead of four. Aspect ratio: 16:9 – Runtime: ~255 min. After a long time of searching to learn whip cracking, I found the Whip Basics DVD series produced by Robby Amper. Robby Amper teaches the different cracks in very simple steps, I was fascinated to see, that he is teaching the techniques from the student's point of view. So it was easy for me to follow his good explanations. 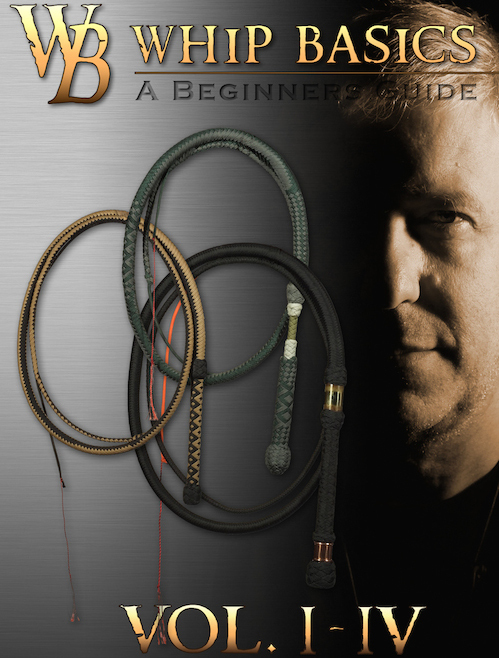 I can highly recommend the Whip Basics DVD series for all whip cracking beginners, it's a must have. I was fortunate enough to win a set of your Whip Basics DVDs at the UK Whipcracking convention and would like to take this opportunity to thank you for producing them. The production quality is second to none. The effort and work involved in producing them is quite evident. Your explanations on the DVDs are very easy to follow and understand. Unlike all the tutorials you see online these days there is no ego on your DVDs which is very refreshing. Your take on whipcracking as a sport and pass time is something everyone should at least see once. I've improved a lot since watching them and still refer to them one in a while. I have and will recommend them to anyone who wishes to take up whips as a sport. This is what cracking whips should be about. 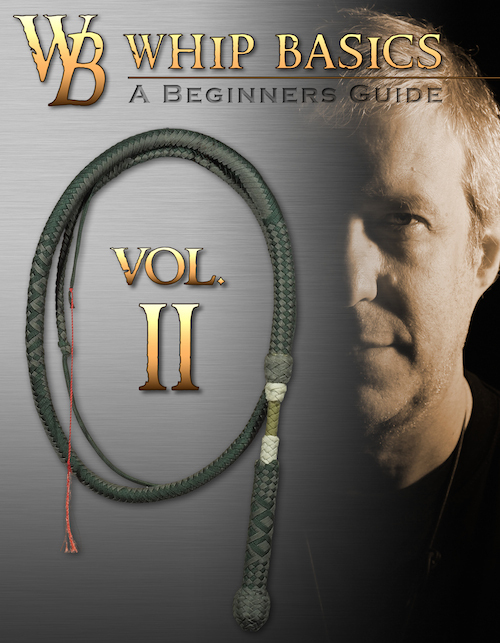 The Whip Basics DVD series by Robby Amper is by far the greatest tool for developing whip cracking skills. Robby breaks down each individual crack to teach the proper mechanics with total control. His attention to the basic details is what makes his teaching technique so great for all levels of whip enthusiasts. The Whip Basic DvDs will take you from a basic single crack and build you into a cracking machine with complete control over your whip. I highly recommend this series for the beginner and old pro alike. Cracking a whip looks like fun ï¿½ and it is! But it's not as easy as it looks. People who pick up a whip for the first time often try to snap it like a towel. Bad move! It's likely to come straight back in their face! These excellent DVDs by Robert Amper will teach you, in simple, straight-forward steps, to handle a whip safely and to acquire great skill. With increased skill comes increased pleasure. You'll build up some complicated-looking routines; but Mr Amper understands that teaching must always start from the student's point of view. He never says, ï¿½Look at this!' and then goes Bam Bam Bam Bam Bam, leaving the student amazed, but discouraged. Instead, patiently and gently, he breaks down every move to its absolute basics ï¿½ and shows how to avoid learning bad habits. He assumes that students start by knowing absolutely nothing. On the other hand, those already familiar with whips won't be bored by these films. They're all about good technique, and presented in such a pithy and straight-forward way that even the experienced can learn a lot. The production of these films is absolutely first class: beautiful photography, excellent editing, well-chosen (and wonderfully calm) music. Robert Amper doesn't focus on himself, but on what he's showing. His overall approach reveals whip-cracking as an almost Zen-like skill, quite remote from violence or macho-posturing ï¿½ a kind of meditative martial art, perhaps even akin to ballet. It's an art that requires far more skill than muscle. For anyone who wants to learn to crack a whip accurately, safely and even beautifully, my own view is that these DVDs are the best possible investment they could ever make. aus der bescheidenen Anzahl von Quellen in der Peitschenliteratur die Geschichte, Philosophie, Konzepte und Theorien zu studieren ist eine Sache, aber die Informationen zur Handhabung in die Praxis, in fliessende Bewegungen umzusetzen ist doch mit Hilfe von Lehrvideoaufzeichnungen oder direktem Unterricht von einem erfahrenen Peitschenlehrer wesentlich einfacher und lebendiger, bzw. motivierender und anschaulicher, um sich in der Peitschenkunst auszubilden. Die weltweite Suche im Internet nach Peitschensport ergab eine lohnenswerte Kuriosität, denn ich stellte fest, dass ein Landsmann, ein international anerkannter Peitschenexperte, sehr hilf- und lehrreiche Videoclips über die Peitschenkunst in englischer Sprache auf Youtube regelmäßig veröffentlichte. Später fand ich einen Link zur Whip Basics Homepage. Eine Lehrvideo-Serie für Anfänger zum Thema Peitschenkunst erwerben zu können war mein großes Glück, und noch dazu mit zahlreichen, nützlichen und detaillierten Informationen wie in dieser DVD Kollektion. Über den Peitschenkauf, den Austausch von Falls und die Herstellung / Anbringung von Crackers, bis zur korrekten Handhabung diverser Peitschen in mehreren Disziplinen - Cracking - Wrapping - Zielpeitschen....... - Unterricht für Lehrer....... ausgezeichnete Hinweise, psychologisch sehr gut fundiert; Das ist wirklich Klasse und Einzigartig!!! - hier stimmt die Qualität und die Quantität, lustige Schauspiel-Szenen erhöhen nicht nur den Unterhaltungswert, sondern belehren den Betrachter einfühlsam und einleuchtend - nach dem Motto: ein bisschen Spaß darf sein - oder - das Salz in der Suppe sollte nicht fehlen! Witzig! Das Preis/Leistungsverhältnis der DVD Kollektion ist supergünstig, angesichts des umfassenden und hohen Lehranspruchs, des enormen Produktionsaufwandes, der Film und Ton / Musik Qualität, sowie der gründlich durchdachten und liebevollen Gesamtgestaltung in natürlicher Umgebung! Deshalb habe ich mir auch gleich die DVD V bestellt und hoffe, dass irgendwann in naher Zukunft Fortsetzungen von lehrreichen Unterweisungen auf DVD VI folgen werden. Für das zusammengefasste Fachwissen in diesen 5 Lehr-Videoï¿½s kann man Herrn Robert Amper eigentlich nicht genug dankbar sein, aber ich möchte ihm zu dieser ausgezeichneten Präsentation hiermit herzlichst gratulieren! Ich bin ein absoluter Neuling im Peitschensport und erlebe gerade meine ersten Peitschenerfahrungen mit einer guten Nylon Peitsche, " The Pharao Jewel Bullwhip - 7 Ft / 16 plait " aus Canada. Nachdem ich ca. zwei Wochen lang, auf den Flügeln der Begeisterung täglich ca. 1 Stunde übte, den Anweisungen wortgetreu folgte und die ersten Erfolgserlebnisse aus der Lehrvideo Reihe I hatte, war ich über die schnellen Fortschritte angenehm überrascht. Meine Englischkenntnisse sind ausreichend und ich verstehe die Erklärungen zu den Bewegungsabläufen, jedoch habe ich die Video-chapter mehrfach angeschaut und mich anfangs täglich mit nur einer Technik beschäftigt, bis ich die Kombinationen erfolgreich mit Cracks beidhändig ausführen konnte. 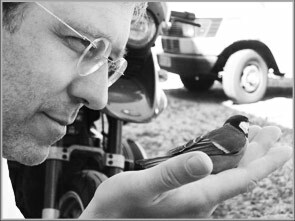 Was für ein cooles Erfolgserlebnis und erhabenes Gefühl, wenn es auch viel Mühe, Geduld und Einfühlungsvermögen erforderte, jetzt knallt die Peitsche beinahe mühelos und der Weg dahin hat richtig Spaß gemacht! Die Peitsche ist eine gute Lehrerin! Hoch motiviert arbeitete ich beständig mit den präzisen Anleitungen aus Video II. weiter und bestaune derzeit meine Fortschritte mit Video III. Die Zielvorgabe von 23 Cracks in Folge und zwei Mal 180 Grad Richtungswechsel kitzelten meinen Ehrgeiz. In einer sinn- und abwechslungsreichen Ablaufkette eingebettet, eröffneten mir diese Cracks die ersten Einblicke in ein faszinierendes Konzentrations- und Ganzkörpertraining mit der Peitsche. Habe nach ca. zwei Monaten am eigenen Leib feststellen dürfen, dass " Happy Cracking " etwas ist, das ich bis ins hohe Alter praktizieren kann, ohne großartige körperliche Anstrengungen zu unternehmen, bei gleichzeitig stattfindenden, sehr positiven Sekundäreffekten von erhöhter Achtsamkeitsentwicklung und erweiterter ganzheitlicher Wahrnehmungsschulung - WOW, das passt prima in meinen bewegungsfreudigen Alltag! Anfangs dachte ich, Ohh..jeh.... auf was habe ich mich da eingelassen? Dafür muss ich mindestens 6 - 8 Monate intensiv trainieren. Doch nun habe ich mich als hingebungsvoller Anfänger überzeugen können und kann behaupten, dass bei einstündigen täglichen Übungseinheiten die Peitschenführung, Bewegungsabläufe und Cracks aus den DVDï¿½s I - III binnen 3 Monaten für den linken und den rechten Peitschenarm, beidhändig erlernbar sind. Ich bin sehr erfreut, denn für mich hat sich diese Investition in meine Ausbildung zur Peitschenkunst zu 100 % gelohnt. Abschliessend möchte ich noch das verdiente Vertrauen für Herrn Robby Amper aussprechen, denn ich hatte zwischendurch e-mail Kontakt und weiss auch seine aktuellen, wertvollen Tipps und freundschaftlichen Hinweise sehr zu schätzen, vor allem was die Whipmaker-Branche betrifft. Wer auf der Suche nach einer qualitativ hochwertigen Peitsche ist, dürfte innerhalb des " Ring of Trust " fündig werden und mit den Kunstwerken der Peitschenhersteller über lange Jahre glücklich und zufrieden sein. Diese repräsentative, lehrreiche DVD Serie und sehr lobenswerte Einführungsarbeit in die Peitschenkunst für Anfänger ( Fortgeschrittene ) kann ich frohen Herzens jedem Peitschensport-Liebhaber wärmstens empfehlen - viel Freude und Erfolge sind garantiert - HAPPY CRACKING! 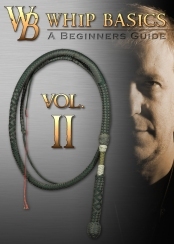 I carry the whip basics series of DVDs because upon reviewing their content I have found them to be extremely informative and an excellent resource of instruction for anyone who wishes to hone their skills as a whip handler. These DVDs are professionally done by Robert Amper who is someone with many years of experience in the film and whip instruction industry. They not only will teach you the fundamentals that you need to understand to get started in whip handling but they will also guide you through more advanced techniques. They are a fine series of instructional DVDs I highly recommend them to my customers. I approached the Whip Basics DVD series from a beginner's standpoint, and found it very useful. Every crack and technique is explained thoroughly and patiently, and the videos go beyond that too. They also contribute to whip safety and basic maintenance, and the audiovisual atmosphere of the videos works well in training a calm, meditative attitude towards whip cracking. While "calm and meditative cracking" might not be everyone's cup of tea, doing things slowly and patiently is the easiest and most efficient way to learn any art. Even the best runners in the world learned to walk first. The DVD set starts from the ground up, teaching the basic cracks and ways to avoid common beginner pitfalls. As a whole, the series goes much deeper than that, and mastering everything in volumes I-IV will absolutely be worth the money and effort. This is not a week-long crash course we're talking about here, it's a learning tool that keeps on giving time after time. The Whip Basics DVD series is not a collection of home videos. It's all done with professional equipment by professionals. So you are not buying anything like the camcorder or cell phone videos you see on Youtube, and your lessons will not have a soundtrack of cars going by or wind blowing on the microphone. The videos offer you beautiful imagery, well thought of settings and camera angles, calm and friendly soundtrack, and considerable production values in general. I highly recommend these videos for anyone interested in learning how to crack whips. Thanks for your Whip Basics collection. I don't think there is a better introduction to the fundamentals of whip cracking on the market. I heartily recommend volume 5 for anyone who is remotely interested in teaching others how to crack whips. When you attend school, or a seminar, or anything like that one of the things you want is an experienced teacher so that you can benefit from not only their knowledge, but their experience. And if you want to teach whip cracking, Robby Amper has plenty of experience that you can benefit from, both in cracking and teaching. The information is planned out and presented very well and in a way that would benefit an aspiring teacher not only of whip cracking, but anything- the lessons on dealing and communicating with students is universal. I haven't started conducting lessons and seminars yet, but when I do, I know I'll be well prepared for having studied Whip Basics Volume V.
I just received my copy of Whip Basics Volume V yesterday. I got the chance to watch it today, and thought I would post some of my opinions on the two-disc set. Like all Robby's works, it comes from a serene viewpoint, a calm mind and a clear eye. But this one is a little more serious than his other videos, which I think is important for communicating the issues it covers. There is sound advice in the opening sequences. The legal warnings alone are greatly appreciated. It's true: where money begins friendship ends. I also love the Say No section. You cannot learn anything you're not truly interested in. It often amazes me how many times the basic philosophy of quality over quantity applies. Not just to the forum members, but to students, to whips, to anything. Are you trying to do your best, or are you trying to raise your count? The difference between them is a difference between honest talent (or reputation) and simple desperation. The point about The Voice is something that the SCA practices. There are people whose responsibility is to watch the area around the fighters, to make sure no one is going to enter their vicinity. They are instructed to shout "Hold!" if this happens. It is so distinctive and rarely-used that it is an instant attention-getter. People are creatures of habit. They will grow accustomed to something if it's always there. So, I think this point was well-made. Mistakes are inevitable. The teacher who "makes no mistakes" never really teaches how to correct it, or what to do when it happens. I would argue that mistakes should be an integral part of the teaching process. "What do you do when this happens?" should be approached. I remember seeing a video on the internet about a police officer who was talking about gun safety, and the dangers of mishandling firearms. Even as he went to draw his gun, just to show some safe ways of handling it, he accidentally fired the gun straight into his hip. Instead of panicking, the officer calmly addressed the class and said "Ok, now this is a great example of what can happen if you're not careful with a gun. This is the time to call 911 and get help." No bravado, no excuses. "I screwed up and shot myself.ï¿½ Believe me, there was not one person in that class who doubted the power of mistakes after that. "Leave it at home" is a concept that is necessary in many professions, not just teaching. I think it's pretty much integral to any job. Your customers don't care whether you had a fight with your wife; they just want you to sell them a burger. And I definitely agree with keeping yourself on the same level as your students. I had just a few martial arts classes, and do you think Sensei was doing all kinds of crazy flips and things while trying to teach me a basic stance? Hell no. He has to show me what to do, right? Show me once and then go on to do other things? That doesn't help me. Students need to build confidence alongside building skill. They have to know they're making progress, or they'll feel their time is wasted and that they should stop trying. That's not teaching. Advice for physical contact is very professional. You go around touching people without asking, and you'll get sued! I love "Balance". Equilibrium is a funny thing, and all those head movements will absolutely mess it up. There are also all of those lovely sayings, like "keep your eye on the ball" that they're thinking of when cracking the whip. It gets in the way. Balance, posture, etc, are all integral to proper cracking, aren't they? The point about feedback from the whip is also important. When it cracks correctly, you can feel it. I agree with "Samurai" as well. No two people are alike. No two people will progress the same way. I love the idea of blending skill levels together. Student Teachers are something where I live, and it really does help them to teach others. Also, with larger groups, it may become necessary to have those advanced students helping to teach. Personally, I prefer being a part of a smaller group, because it gives more time with the teacher. "The Pen Is Mightier Than The Sword" makes a valid point in that, to teach something physical requires a blending of instruction and the actual physical motions. How can you ever expect to portray something correctly to someone without ever showing them what it looks like? If you hadn't done this in Whip Basics Vol I, I would never have understood the Circus Crack the way I did, or as quickly as I did. Motions which support instruction; I think it's a necessary component of teaching. "Target Work" talks again about building confidence with small victories. I know I mentioned my opinion about this on the forum. Showing off to you students is never going to make them feel good about their abilities. It's disrespectful, disheartening, and arrogant. I cannot agree more with this point. Nobody wants to feel belittled. "Friend or Student" needs to be at the forefront of a teacher's mind. There needs to be a respect for the teacher's abilities and knowledge, such that the student does not dismiss instruction. It's not just to preserve credibility in front of other students, but also to help that student to go beyond "buddies" and pay attention. Again, it's an issue of respect. This time it's respect for the teacher, as well as for the other students. If you want to learn from someone, you have to be willing to listen. "To Crack or Not To Crack" is really an issue of grace over muscle. Whips are not clubs. It takes more talent to control the whip than it does just to make a loud noise. There is a difference between flailing away with a tool and actually using it to produce a desired effect. "The Inner Child" really does seem to be an American style of teaching. It starts by describing some brutally detached and cold attitudes that I have encountered many times in trying to learn from others. It doesn't work. A real teacher is supportive, a guiding hand. And I remember talking about the point of treating adults and children with equal respect, by showing them the same methods and techniques. Children can understand the techniques; they just require a bit more support and understanding. Frustration has never been a good teaching aid. Basically, I believe this is an exceptionally helpful guide, not only for teaching how to crack whips, but for teaching in general. I would put this against any other method in existence. Respect, knowledge, guidance, support, understanding...these are the tools of a teacher. If you use them all, you build a better student. You may even build another teacher. I am very happy that I got the chance to see this. You have done very well, Robby. I will recommend this to anyone who wants to become a teacher. Please mind the safety advice on the DVD at all times. Whips are not toys and should be treated with utter respect. Therefore beginners should guard their eyes and wear sturdy clothes! You don’t need a fireman’s helmet or a knight’s armour... But solid shoes, a jacket with long sleeves, trousers made out of solid frabrics and safety glasses.